3.2 EAI Wiki | De B.A.A.T. A Wiki is a web based graphical user interface commonly known from the WikiPedia web site. There are however also a number of organisations who use a Wiki as a basis for sharing knowledge within the organisation. Together with the open (source) environment and ease of use, we decided to use a MediaWiki to present the SOA information. The main feature of the EAI Wiki is that most information is (hyper) linked to other information and can be reached by clicking on the hyperlink. 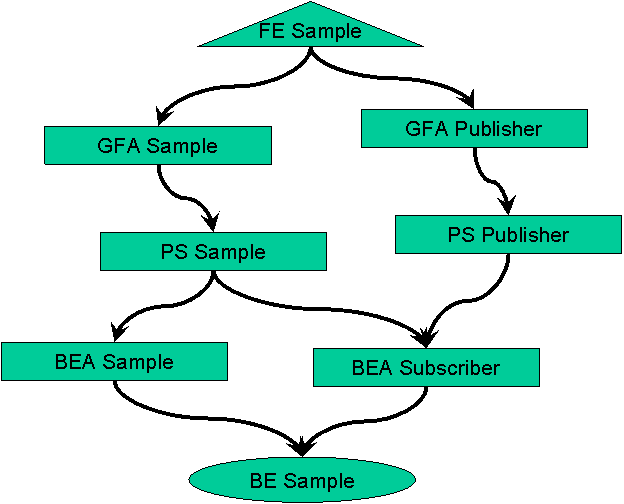 In an overview of related services (see Figure 4 for an example), each entity is clickable and leads to the page with more information on that entity. The functional specifications and other relevant documents are stored on the Wiki server and can be accessed via an hyperlink. Quality Assurance needs to know the relations between the different services to determine the effect of a request. Business Analysis needs insight into the existing set of services and their status in order to determine the effort to develop a new chain. Development likes to know the relations between different services to be able to determine the effect of a change in one service in relation to other services. Management wants to base their decisions for e.g. budget on a correct and complete set of information. The next sections give an overview of the pages which are currently implemented in the EAI Wiki. The Chain register is a page which shows a clickable list of all Chains present in the EAI Wiki. It is automatically generated from all Chain pages currently available in the EAI Wiki. The Chain page itself contains information on the chain like a description, version history, classifications and a picture with the services involved (see Figure 4 for an example). The Component register is an automatically generated page with a list of all components present in the EAI Wiki. The structure of a Component page is similar to the Chain page with a description, version history, classifications and a similar picture but then with the focus on all services which are part of the particular component shown. The System register is also an automatically generated list but then of all System pages. It shows 2 lists, one for the Front End Systems and one for the Back End Systems. Again the structure of a System page is similar as the Component and Chain pages. This makes the use of the Wiki easier. One of the characteristics of a service is its visibility: Protected (only available for use by EAI services) or Public. The Public Service register shows a generated list of all services which are available for Front End Systems. With this register, the business customers can have insight into the functionality already available for possible re-use. The structure of a Service page is again similar to the other pages.